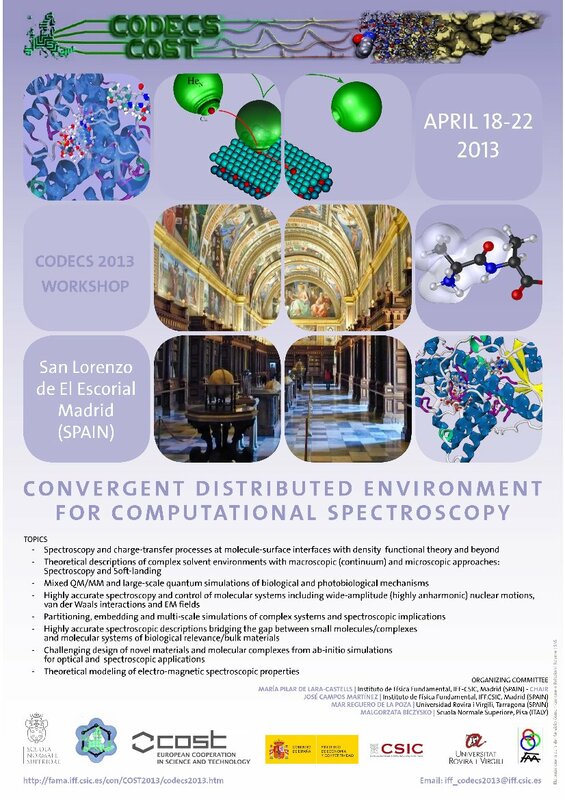 CODECS 2013 Workshop, Madrid (2013). (1) Spectroscopy and charge-transfer processes at the interface between organic molecules and surfaces with density functional theory and beyond. (2) Theoretical descriptions of complex solvent environment with macroscopic (continuum) and microscopic approaches. (3) Mixed QM/MM studies of biological mechamisms. (4) Highly accurate spectroscopy of molecular systems including wide-amplitude (highly anharmonic) nuclear motions and van der Waals interactions. (5) Dynamical effects in the slow motion regime.